The emanation of Palchen Dorji Zhonu, the embodiment of all the past Buddhas, and the one who appeared in Bhutan in person, Namgyal Lhundup, was born at Chapthra Rimtangkhar, Thimphu, in 1718 (Earth Dog Year of the second rabjung). As a boy, he went to live with Je Ngawang Drukpa (alias Ngawang Gyaltshen, reign: 1724-1730) at Tshamdra Gonpa and was given the name Namgyal Lhundup. There he got his early education from reading, writing, and empowerment to initiation. He climbed the monastic ladder from a personal assistant to his master to his inner chamberlain. During a visit to Tshamdra Gonpa by Sakya Rinchen, who later became the ninth Je Khenpo, he received a novice ordination (getshul). In 1748 his master Je Ngawang Drukpa passed away. After all necessary rites were completed, he went to Paro Taktshang and meditated on Phurpa Yangsang Lamed, a treasure text of Ratna Lingpa (1403-1478). Because of the karmic connection, the blessing of his master, and his own devotion and perseverance, his tutelary deity Dorji Zhonu appeared in person and blessed him. He thus became drupthob, an accomplished meditation master. To celebrate his accomplishment, he flung a ritual cake (juntor), and vanquished all his adversaries. At that time, the Thimphu Dzongpon, wanting to test his accomplishment, made Namgyal Lhundup ride his wild riding horse. However, nothing happened to him on the way. Impressed, the Dzongpon became his follower. At Taktshang, Namgyal Lhundup discovered several hidden treasures (ter): a self-emanated red ritual cake of stone, a sacred bowl, and a skull, all of which can be seen at the Padtselling Monastery even today. The skull is believed to reveal different images of deities to different people depending on their faith and devotion. At the time of being blessed by this skull, some people with karmic connections can see ambrosia (dutsi) dripping from the skull. There is a prophecy that the lid of this sacred bowl will open on its own in future. The other sacred object is a ritual dagger (phurpa), which, it is believed, can be used for subduing the devils and rolong (zombies) in future. The dagger’s material is not known. However, it is commonly believed that Namgyal Lhundup had made it from rice, which was served as a snack (zhetsam) with tea at one time at Taktshang. There are fingernail imprints on both the faces of the dagger, with a crocodile image attached to it. The dagger is carried by all his successive reincarnations. Nail imprints on the faces of the dagger and the crocodile are believed to be made by Namgyal Lhundup while making it from rice. Namgyal Lhundup had left his thumb imprint on a stone and made into different shapes from them with his hands like boiled rice, all of which can be seen at the monastery. All these evidence point to Drupthob’s accomplishment of high spiritual power. Although Namgyal Lhundup was registered with the central monastic body, he escaped the strictures of the monastic life and went on a pilgrimage to Tibet to see the Jowo at the age of 32. Before the Jowo he started the recitation of Phagpa Zangpo Chodpai Monlam one billion times. In 1750, the civil ruler of Tibet Dalai Bahadur Jurme Namgyal, a son of King Sonam Tobgyal, had passed away and was succeeded by Zhabpad Doring Pandita Gonpo Ngedup Rapten. At that time, a deadly spirit had possessed a corpse of Gonpo Ngedup Rabten’s principal minister. All remedies and all tantric masters (ngagpa) were of no use. One accomplished master died after a week having attempted to exorcise the devil. Frightened, no tantric master could dare to go near the corpse. Two weeks later, they heard about a certain Bhutanese master praying at the feet of Jowo and requested for his help. Namgyal Lhundup agreed and went to see the corpse. The evil spirit inside the corpse spoke, ‘Oh! A young monk has also come!’ and began to charge Namgyal Lhundup with his hands. Namgyal Lhundup transformed himself into a real figure of Palchen Dorji Zhonu. With a deep compassion at heart, he first threw some mustard seeds on the corpse, and pressed it down with his ritual dagger. The evil spirit immediately left, crying. The corpse fell on the floor and turned into a rotting smelling body. Thus, Namgyal Lhundup subdued a much dreaded spirit. From then on, he came to be known all over Tibet as an accomplished master who vanquished zombies. Thereafter, the occurrences of zombies in Tibet diminished to great extent. In return for his service, Gonpo Ngedup Rapten offered him a place to stay in Tibet with followers, and requested him to stay there permanently. Namgyal Lhundup refused the offer. However, it was decreed that in future whenever Namgyal Lhundup travelled in Tibet and wherever he stayed, he would receive all kinds of services, including horses.Namgyal Lhundup then returned to Lhasa and continued his Zangchod Monlam recitation. As he was reciting one day, the Jowo spoke, Son! Don’t be very ambitious Go instead to the south East of Kurje Lhakhang in Bumthang is a place Make it your monastic seat You will fulfil your dreams Name it Jangchub Pelri. After completing the recitation of Phagpa Zangpo Chodpai Monlam one billion times before the Jowe, he made a wish that in the future let the Molam Chenpo spread in the world and aspire to satrt one in Bhutan. To this day the people say the wide spread of Molam Chenpo is the outcome of his wish. Following the prophecy, Namgyal Lhundup returned to Bhutan. Gonpo Ngedup Rapten offered many gifts to him, but he accepted only what was necessary on the way. When Gonpo Ngedup Rapten insisted on accepting them for his personal satisfaction, he remembered a dream in which a monk told him about a religious scroll (thangka) of an eleven-headed Avalokiteshvara, the Buddha and Guru Rinpoche, all painted by Trisong Deutsen’s (790-844) own hands. They were in the king’s treasure house at Samye. Being told in his dream that if those scrolls could be acquired by any chance they would benefit him greatly in spreading the Buddha-Dharma, he requested Gonpo Ngedup Rapten for them. The king was quite hesitant to spare them. He finally agreed in gratitude for his service. These thangkas, which can be still seen at the Padtselling Monastery today, are revealed to the public every year during the Padtselling commemorative ritual (kucho). The Avalokiteshvara image has been painted in a royal look, the Buddha in Indian tradition, and that of Guru Rinpoche in Guru Nga Drama style. Since they are highly sacred, any unfortunate events of this lifetime will be removed by merely looking at them, and one would straight go to the heavenly abode after death. On his way from Lhasa, he visited and meditated at Yang Dzong, Samye Chimphu, Tsari and other sacred places of Guru Rinpoche. On arriving at Zungkhar Lheding, he met Nyenlam Gyalwa Chogyang, the one who was no different from Guru Rinpoche and Ugyen Drime Lingpa, the great treasure revealer, an emanation of Shudbu Palseng, also known as Garwang Dudul Lay Rabtsal or Thegling Drodon Tharchen. In religious songs, he is known as Drodon Tharchen. 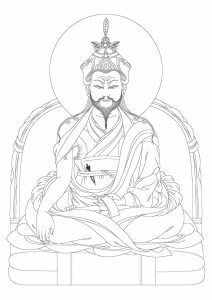 On meeting Drime Lingpa, he recollected the following verse from Dremi Lingpai Dagnang Lama Thugi Nyingpo Chodag Lungten: As many as twenty five future teachers bearing the names Geleg Thubten Lhundup Lhun, Ugyen etc., will appear in U, Tsang, Dagpo, Kongpo, Ngalor, Mon, in the upper and lower Dokham and Lhodrag by force of their karmic connections. May the sublime teachings be passed onto them; by so doing will pacify all obstacles and hindrances in their mission? Similarly, the following prophecy is mentioned in Chimi Dorji Sokdrub discovered at Yangdzong, by destiny, a heart son of mine (Guru Rinpoche) will be born in U Tsang, Dagpo, Kongpo, Kham or Mon by the name Lhundup. Rigzin Drime Lingpa recognized Namgyal Lhundup as the man prophesied in the sacred scriptures of Guru Rinpoche for teaching the treasure teachings in future, and took on the responsibility to give empowerments, transmissions, and instructions on all treasure teachings: Tercho Thugdrub Yonten Kunjung, Gurdrak, Tshedrub Dorji Sokdrub, Thuje Chenpo Khorwa Jigdrol and others. On his part, Namgyal Lhundup too made great efforts to practice the teachings. Combined with the past destiny, he was able to visualize various tutelary deities within a short time, which signified his accomplishment. This made Drime Lingpa happy, and empowered him to help all sentient beings with these teachings. Just as he was about to leave, the master gave a farewell speech: My extraordinary student, Drukpa Geshe Namgyal Lhundup; now that the time has come for you to return to your country, do you wish for any advice or religious songs from me? I will be very happy to share them to you. Thus the great master shared all the sacred teachings to his heart student. After receiving the teachings, he took the leave of Drime Lingpa, and as prophesized by Jowo, he went to Bumthang via Lhodrag. On the way he visited Guru Rinpoche’s sacred place of Singye Dzong at Lhuntse. After spending a few days there, he continued his journey and finally arrived at Bumthang Kurje, carrying his treasure gifts offered by Gonpo Ngedup Rapten. While he was at Kurje, the people of Sengor pleaded him to subjugate a dreaded devil residing at Dochutigang. The devil appeared even during the day and stole people’s sok (life force) that travellers had to move in groups. All religious masters were helpless. After hearing about the people’s sufferings, he went to Sengor and meditated at Dochutigang for three days. He not only subdued the devil completely, but made the devil to take a vow not to harm any living being thereafter. His footprints and body imprints of the devil can be seen today on rocks at the site of subjugation. His fame as the one who subdued the devil spread. While travelling from Sengor to Saleng, the people of Saleng requested him to subdue a malicious devil that was terrorizing the people. Long time back the devil was known to have taken the life of Ura Dung Nagpo (ruler of Ura). He subdued the Saleng devil and built four chortens in four directions, and a fifth one in the centre as deterrence against future devils. According to the village elders chortens contain many sacred relics. A cypress tree growing next to the chorten is also believed to be his walking staff. Whatever be the beliefs, one can be sure of the tree’s unique fragrance like no other trees. Zhongar Dzongpon Punda Rika alias Pekar who later became the Fifth Trongsa Penlop (1768-1774) heard about his fame, and sent his attendants to invite him to subdue Golong Tsen residing near Zhongar Dzong. The devil was deadlier than the one at Sengor, such that it could bring down even birds from the sky. No religious master was able to subdue it. Drupthob Namgyal Lhundup accepted the invitation and went to Zhongar. He pitched a tent on the top of the cliff believed to be the citadel of Golong Tsen. He was to meditate for seven days during which he was not to be disturbed. Dzongpon began to suspect that Drupthob too must have died like the other masters, who died while trying to subdue the devil, and sent his attendant on the morning of the seventh day. The attendant peeped inside the tent and saw the Drupthob sitting upright in a deep meditation and pinning down two gigantic snakes with his hands. The frightened attendant rushed back to inform the chieftain and died soon after. Drupthob subjugated Golong Tsen and made it take an oath not to harm any living beings thereafter. Golong Tsen in turn requested for a vegetarian food from the local people for his survival. Because he was disturbed during his meditation, some evil elements remained, and people attribute it as the real cause of the destruction of the Zhongar Dzong years later. According to the local accounts, Golong Tsen would transform into a man at night and regularly visit the daughter of the chieftain of Tsamang Tokari at night, never revealing his true identity. During one such visit, the girl, eager to find out her lover, tied a string to the little finger of his leg without his knowledge. The next morning, she followed the string, which took her to a gigantic snake on a cliff. Frightened, she died instantly. She became the spouse of Golong Tsen. Today, local people make offerings to her every time they propitiate Golong Tsen. After subjugating Golong Tsen, his fame spread and the local people made him their root lama. Dzongpon and the people made many offerings and offered commitments to carry out his orders. At that time, following a prophecy, he asked the Dzongpon to make several phurpa (ritual daggers). The Dzongpon immediately summoned sculptors, and the phurpa were made under the supervision and direction of Drupthob himself. The phurpa can be seen at Padtselling Monastery even today and Jangdhung village, where these phurpa were made, is also called Phurpa Dhung to this day. At the time of performing phurpa installation ritual at the Padtselling Monastery, two extra phurpa the sculptors had made flew away – one to Trongsa Trellar and the second to Bubja village as deterrence against the devil residing on a cliff. The one that landed at Trellar is considered as an auspicious sign that his reincarnation would visit the place. The one which landed at Bubja began to glow at night. Suspecting the glow must be that of a precious wood burr (dza), the local people went to the site one morning. To their surprise, they found a phurpa. They immediately began to prostrate and pray, and after making a marchang offering they took it to their village. Today, it is in the house of Changra Zochi Drep Dasho Yodsel. Since it is believed to be a deterrent against the Bubja devil, a window of the chosham (where the phurpa is kept) facing the Bubja cliff is kept open even at nights. There was another devil residing at Lingmithang, near Zhongar who had taken the life of at least one person crossing the bridge. No one was able to subdue the devil. Finally, Drupthob Namgyal Lhundup was requested to subdue it. But no sooner did he arrive there than the devil ran away and hid inside a rock on the face of a cliff below a chorten near the present day motor road at Lingmithang. The Drupthob began to build a stone wall from outside with his miraculous power, and even as he was building the wall, the devil cried out from inside and requested the Drupthob to keep at least a hole in the stone wall for him to breathe. The hole can still be seen today. The bridge was enlarged as deterrence to the devil, and thereafter it came to be known as Drupthobzam. This story sculptured on a slate at Kakaling near Drupthobzam can be seen even to this day. Not long after his return to Bumthang Kurje, carrying all the offerings from Zhongar he went to look for the site prophesied by Lhasa Jowo. Assuming that the present day Takar Zhong must the prophesied site he went there. All the local guardians of Padtselling welcomed him to Takar Zhong, and informed him that the site was farther uphill. The people of Takar Zhong accompanied him uphill and it is for this reason that when the thongdrols (religious scrolls) are unveiled to the public every year, the people of Takar Zhong are given the honour of carrying them from inside the temple to the ground. The Drupthob gave a cymbal, a hand-written Dorji Chodpa (Diamond Sutra) and a pair of shoes which he had brought from Tibet to his Takar Zhong host. The cymbal and Dorji Chodpa can be seen today. While climbing uphill towards the present day Padtselling, the Drupthob felt thirsty. But there was no nearby water source. So he took out two springs—a male and a female—and blessed them, such that anybody drinking this spring water will be protected from any unfortunate incidences in future, and that any obscuration of their mind will be washed away. After arriving at a plain east of the present day monastery, the Drupthob proceeded to lay the foundation of the future monastery. But a tshomen (water spirit) dwelling in the nearby forest tried to harm the group. The Drupthob over-powered her and turned her into a rock. Finally, on arriving at the present monastery site, which used to be the pastureland of the successive governors of Jakar Dzong, the Drupthob confirmed it as the site prophesised by the Jowo and camped there. A few days later, Jakar governor saw a plume of smoke bellowing above the place and sent two of his attendants. They found a Drupthob and chased him away. He fled and settled behind the ridge for sometime. The ruin of his hut, where he stayed, is still visible today. The consequence of chasing the Drupthob was fatal. Soon after the incident an equine disease spread in the Jakar Dzong and no rituals could control it. Horses started to die one after another. At last the governor was advised to seek the Drupthob’s help. He agreed and performed a gegthro, a ritual to evict negative elements. As the ritual was being performed, an evil force, in the guise of a pig and the size of a donkey, escaped from the stable. The next day, horses began to recover slowly. It is said that the whole of Bumthang never saw the equine disease from that day on. The governor was impressed by the Drupthob’s power and apologized for his past misdeeds and offered his grazing land to build his monastery. At the same time, the Zhongar chieftain by the name Pekar, a devout follower of the Drupthob, became Trongsa Penlop in 1768. With Pekar’s support, the people of Bumthang provided free labour for the construction of the Padtselling Monastery which was completed in 1769. From then on, the people of Bumthang, Trongsa, Zhemgang, and Zhongar and places as far as Dungsam (Pema Gatshal and Samdrup Jongkhar) came to visit the monastery in large groups to receive his teachings. That prompted him to establish a monastery for lay monks at the outskirts of the main monastery and a nunnery to its left. Namgyal Lhundup heard about a famous Rigzin Jigme Lingpa and went to see him in Tibet. There he received Longchen Nyingthig and many other teachings. At that time only Drukpa Kagyu tradition was widely practised in Bhutan. He requested for the permission to practice both Longchen Nyingthig and Drukpa Kagyu. The request was promptly granted by his great master. Today, the tradition continues at Padtselling many years later. While he was receiving teachings from Jigme Lingpa, Jigme Kundrol was also a student. Since he too came from Thimphu, he showered deep affection on him during their stay together. On his return journey to Bhutan, he visited his teacher Drime Lingpa at Lheyding and received teachings from him. He then went to Samye. By that time the Seventh Dalai Lama had passed away and Ngawang Jampal Delek Gyamtsho was a regent. The regent heard about his great power and granted him an official letter, in addition to the one given earlier, authorizing him the free use of man and horses while travelling across Tibet. The Drupthob also revealed his powers in other forms. An evil spirit called Dodgyal had possessed Tara Sarpa Depa, who later came to be known as Tatshag Jedrung, an assistant ruler of Tibet, who later became a regent. After all remedies and famous meditation masters of Tibet had failed, they invited the state oracle. The oracle said that the master adept from Bhutan was far better than him, and suggested his invitation instead. Accordingly, the noblemen of the court invited Namgyal Lhundup. The Drupthob meditated on Lokdren Rabtu Zompa and hit the patient with his beads continually while at the same time pressing his phurpa on his body. This drove the Dep unconscious and all the attendants including his wife started to cry, assuming him to be dead. He advised them not to cry and assured that the Depa would recover slowly. He then poured sacred water into Depa’s mouth, and to everyone’s surprise, the patient came back to life. He continued to shower blessings and the Depa was cured. The Depa and his wife made offerings in gratitude. He then returned to his monastery at Padtselling in Bumthang. From there on, the fame of Drupthob Namgyal Lhundup as one who subdued zombies and devils spread everywhere. He was also responsible for subduing the dreaded evil in Mangde Drangjay valley and wiping Langthil Wenkhar off the evil effects. In brief, he was the one to subdue all the evil spirits and devils across the country. Norbu Pekar, a student of the Tongpon of Acharya Khapuchen once invited him to Norbuling at Dungsam where Arti Sonam Darjay was sponsoring a religious teaching. During that time, Bhutan was ruled by the Sixteenth Desi Sonam Lhundup (reign: 1768-73) and Bhutan and the British India were fighting a war at Pasakha. At the same time, Dungsam Ja Drung and Assam Raja were also at loggerheads over their borders in the eastern part of Bhutan, causing immense sufferings to the people. After Dungsam Ja Drung sought the Drupthob’s help, the latter went to Yongla Gonpa in Pemagatshal. There he flung a ritual cake (martor) in the direction of the enemies, causing rain of blood to fall on the army camps of the Assamese king. Wild animals ran about the camps making ominous cries. This frightened the enemies and they all ran away. Dungsam Ja Drung was victorious. Dungsam Ja Drung and the people made a huge offerings to the Drupthob in gratitude for saving the lives of so many people and bringing victory to the country through his spiritual powers. His fame spread even more. A stone, bearing the shape of a ritual cake thrown by Padtselling Trulku for deterring any external attacks in future, subduing all kinds of devil and evil spirits and clearing away all hindrances so that peace and harmony may dawn on the people, can be seen to this day below Yongla Gonpa. A similar stone attributed to Drupthop Namgyal Lhundup can also be seen behind Yongkala in Mongar. The Drupthob then returned to Bumthang and organized mani, vajra guru and phurpa recitation ceremonies for his followers. He made sure that the offerings he had received from his devotees were not wasted. The rest of the time, he taught whatever his students wanted to learn. In the meantime, the people of Dorjibe suggested that the Drupthob should stay in Dorjibe to avoid climbing the hill to Padtselling in his old age. He agreed and Dorjibe Lhakhang was thus constructed as his residence. Thereafter, later reincarnations appointed their representatives at the Lhakhang. According to the local account, a lhakhang was to be built above the Dorjibe village on a hillock with the shape of a double-vajra. However, due to lack of water in the area, the lhakhang was built at the present site. The village was named Dorjibe after the shape of the land, which looks like a double-vajra. The vajra shape is not visible clearly today due to the growth of pine forests. The Lhakhang is located at 2520 metres above the sea level. Once Jigme Lingpa instructed his Bhutanese student Jigme Kundrol to visit Yongla Gonpa in Mon. Jigme Kundrol mistook Bumthang Tang Thowa Drak for Yongla Gonpa and meditated there for three long years. From there, he went to live at Wangthangla, Ura. After realizing that it was not the place prophesied by Jigme Lingpa, he went to see Drupthob Namgyal Lhundup from whom he received many teachings. Not long after, Norbu Pekar from Norbuling, Dungsam, who was a devotee of Drupthob Namgyal Lhundup, sent a request once more to conduct Dutsi Mendrub ceremony at Dungsam. By that time, Namgyal Lhundup was quite old to undertake a long journey. So, he deputed Jigme Kundrol and conferred on him the post of Yongla Lama for the benefits of the people and the Buddha-Dharma. Jigme Kundrol founded the Dungsam Yongla Tengay Riwo Pelbar Ling monastery, a place prophesied by his master Jigme Lingpa, for promulgating the Buddha-Dharma, and most importantly for benefiting all sentient beings, and Bhutan in particular. Later, Norbu Pekar, Drupthob Namgyal Lhundup’s devotee and patron, retired from his post. 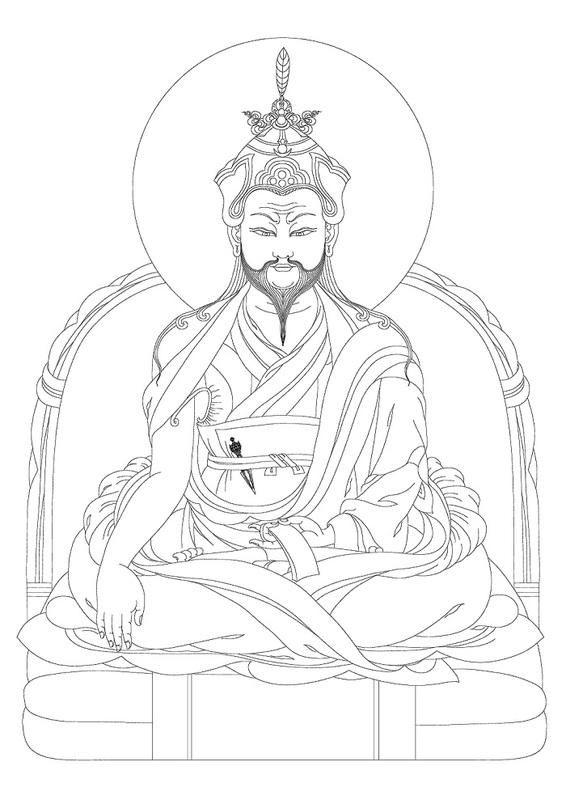 He wanted to see Jigme Lingpa and requested the Drupthob to help him meet the great master. The Drupthob could not refuse his request and travelled to Tibet again. The two met Jigme Lingpa and with prayers to meet in future, the Drupthob returned to his residence in Bumthang. Not long after, the embodiment of Palchen Dorji Zhonu, Master Namgyal Lhundup died peacefully at the age of 68 in 1786 corresponding to the 20th Day of the Fourth Month of Fire Horse Year. Thousands of followers and devotees gathered to bid final farewell to their great master. Prayers for quick rebirth were made, and the scale of the rituals organized touched even the heaven. Rainbows shone in the sky and rain-flower showered on the earth and the very air around the place was filled with fragrance. When the attendants opened the funeral chamber they found many body relics like dungsha riram. Beginning that evening, a prayer ceremony called Padtselling Kucho is performed on the Fourth Month of the 20th Day of every year.